Mamma Mia! Here We Go Again is a 2018 jukebox musical romantic comedy film written and directed by Ol Parker, from a story by Parker, Catherine Johnson, and Richard Curtis. It is a follow-up to the 2008 film Mamma Mia!, which in turn is based on the West End/Broadway musical of the same name using the music of ABBA. The film features an ensemble cast, including Dominic Cooper, Amanda Seyfried, Pierce Brosnan, Colin Firth, Stellan Skarsgård, Jeremy Irvine, Josh Dylan, Hugh Skinner, Lily James, Jessica Keenan Wynn, Alexa Davies, Christine Baranski, Julie Walters, Andy García, Meryl Streep, and Cher. 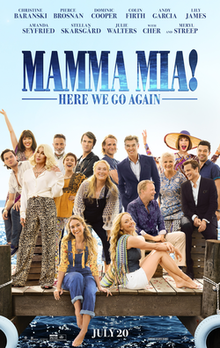 Both a prequel and a sequel, the plot is set after the events of Mamma Mia!, and also features flashbacks to 1979, telling the story of Donna Sheridan's arrival on the island of Kalokairi and her first meetings with her daughter Sophie's three possible fathers. Due to the financial success of the first film, Universal Pictures had long been interested in a sequel. The film was officially announced in May 2017, with Parker hired to write and direct. In June 2017, many of the original cast confirmed their involvement, with James being cast in the role of Young Donna that July. Filming took place from August to December 2017 in Croatia, Bordeaux, Stockholm, Oxford, Hampton and at Shepperton Studios. A British and American joint venture, the film was co-produced by Playtone, Littlestar Productions and Legendary Entertainment. Mamma Mia! Here We Go Again was premiered at the Hammersmith Apollo in London on July 16, 2018, and was released in the United Kingdom and the United States on July 20, 2018, ten years to the week after its predecessor's release, in both standard and IMAX formats. The film was a box office success, grossing over $394 million worldwide and received generally positive reviews, with critics praising the performances and musical numbers. Sophie Sheridan is preparing for the grand reopening of her mother Donna's hotel, following Donna's death a year earlier ("Thank You for the Music"). She is upset because two of her fathers, Harry and Bill, are unable to make it to the reopening and she is having trouble in her relationship with Sky, who is in New York, over her memorializing her mother's life ("One of Us"). In 1979, a young Donna graduates from New College, Oxford with Rosie and Tanya ("When I Kissed the Teacher"), and prepares to travel the world. In Paris, she meets and parties with Harry. They spend the night together ("Waterloo"), but Donna leaves soon after. She misses her boat to Kalokairi but is offered a ride by Bill, and along the way, they are able to help a stranded fisherman, Alexio, back to shore in time to stop the love of his life from marrying another. Unbeknownst to Donna, Harry has followed her to Greece; but he arrived too late, and sadly watches the boat sailing off in the distance ("Why Did it Have to Be Me?"). In the present, Tanya and Rosie arrive to support Sophie with the reopening and it's revealed that Rosie and Bill have split up ("Angel Eyes"). Sophie then visits Sam, who is still grieving over the death of Donna. Back in the past, Donna arrives on the island ("I Have a Dream") and while exploring the farmhouse, a sudden storm causes her to discover a spooked horse in the basement. She finds a young Sam riding his motorcycle and he helps her to save the horse. Back in the present, a storm has caused serious disruption to Sophie's plans for the grand reopening and prevented media coverage of the event. Back in the past, Donna and Sam are enjoying a whirlwind romance ("Andante, Andante", "The Name of the Game"), until Donna discovers a picture of Sam's fiancée in his drawer. Devastated, Donna demands Sam to leave the island and refuses to see him again ("Knowing Me, Knowing You"). In the present, Sam tells Sophie about her value to her mother. Meanwhile, Harry leaves his business deal in Tokyo to support Sophie, and in Stockholm, Bill gets the same idea. Bill and Harry meet at the docks but are told there are no boats. However, Alexio gives Bill, Harry, the newly arrived Sky and hundreds of others boat passage. In the past, a depressed Donna is heartbroken over Sam but is able to channel her anger into singing with Tanya and Rosie ("Mamma Mia!"). She meets Bill again and they go out on his boat; while they are gone, Sam returns, having recently ended his engagement for Donna, but is saddened to hear that she is with another man and leaves the island once again. Donna discovers she is pregnant but has no idea which one of her three recent lovers is the father. Sofia, the mother of the owner of the bar where Donna and the Dynamos performed, overhears Donna's wish to stay on the island, and Donna happily accepts her offer to let her live at her farmhouse, where she eventually gives birth to Sophie. Back in the present, the guests have arrived at the party and Sophie is reunited with her other two fathers and Sky ("Dancing Queen"). Sophie reveals to Sky that she is pregnant and has never felt closer to her mother, having now understood what her mother went through. Bill and Rosie reunite over their grief for Donna. Sophie's estranged grandmother and Donna's mother, Ruby, arrives despite Sophie having decided not to invite her. She reveals that Sky tracked her down in New York and she wants to build a real relationship with Sophie. Sophie then performs a song with Tanya and Rosie in honor of her mother ("I've Been Waiting For You"), with her grandmother tearfully telling her afterwards how proud she is of her. It is then revealed that the manager of the hotel, Fernando, is Ruby's former lover from 1959 in Mexico, and the two are joyously reunited ("Fernando"). Nine months later, Sophie has given birth to a baby boy. Everyone has gathered for his christening where Tanya flirts with Fernando's brother. The ceremony takes place with Donna's spirit watching over her daughter with pride ("My Love, My Life"). At the end, all the characters, including Donna and the younger cast, sing "Super Trouper" at a huge party at Hotel Bella Donna. Amanda Seyfried as Sophie Sheridan, Donna's 25-year-old daughter. Meryl Streep as Donna Sheridan-Carmichael, Sophie's mother and Sam's late wife. Lily James as Young Donna, founder of Donna and the Dynamos. Christine Baranski as Tanya Chesham-Leigh, one of Donna's best friends and former bandmates in Donna and the Dynamos; a rich three-time divorcee. Jessica Keenan Wynn as Young Tanya. Julie Walters as Rosie Mulligan, one of Donna's best friends and former bandmates in Donna and the Dynamos; a fun-loving author in a relationship with Bill. Alexa Davies as Young Rosie. Pierce Brosnan as Sam Carmichael, an architect, Sophie's step-father and possible father, and Donna's widower. Jeremy Irvine as Young Sam. Colin Firth as Harry Bright, Sophie's possible father, a British businessman. Hugh Skinner as Young Harry. Stellan Skarsgård as Bill Anderson, Sophie's possible father, a Swedish sailor and travel writer, Sofia's great-nephew, Lazaros's cousin, and also as Kurt Anderson, Bill's obese twin brother. Josh Dylan as Young Bill. Dominic Cooper as Sky, Sophie's husband. Cher as Ruby Sheridan, Donna's mother and Sophie's grandmother. Andy García as Fernando Cienfuegos, the Mexican manager of the Hotel Bella Donna, old lover of Ruby's from 1959. Omid Djalili as a Greek customs officer. Celia Imrie as the Vice-Chancellor of the university at which Donna, Tanya and Rosie studied. Maria Vacratsis as Sofia, Bill's great aunt and Sophie's namesake, a local who owns the shack in which Donna and Sam stay and which eventually becomes Donna's home. Panos Mouzourakis as Lazaros, Sofia's son and Bill's cousin who owns the bar at which both his band and Donna and the Dynamos perform. Gerard Monaco as Alexio, a local Greek fisherman. Anna Antoniades as Apollonia, Alexio's lover and later wife. Jonathan Goldsmith as Raphael Cienfuegos, Fernando Cienfuegos's widower brother. Björn Ulvaeus as a university professor. Benny Andersson as the pianist in the Parisian restaurant during "Waterloo". A soundtrack album was released on July 13, 2018 by Capitol and Polydor Records in the United States and internationally, respectively. The album was produced by Benny Andersson, who also served as the album's executive producer alongside Björn Ulvaeus and Judy Craymer. Each song is featured within the film, with the exception of "I Wonder (Departure)" and "The Day Before You Came". † Songs featured on the soundtrack album but omitted from the film. ✗ Songs featured in the film but omitted from the soundtrack album. Due to Mamma Mia! 's financial success, Hollywood studio chief David Linde, co-chairman of Universal Pictures, told the Daily Mail that it would take a while, but there could be a sequel. He stated that he would be delighted if Judy Craymer, Catherine Johnson, Phyllida Lloyd, Benny Andersson and Björn Ulvaeus agreed to the project, noting that there are still many ABBA songs to make use of. Mamma Mia! Here We Go Again was announced on May 19, 2017, with a release date of July 20, 2018. It was written and directed by Ol Parker. On September 27, 2017, Benny Andersson confirmed 3 ABBA songs that would be featured in the film: "When I Kissed the Teacher," "I Wonder (Departure)," and "Angeleyes." "I Wonder (Departure)" was cut from the film, but is included on the soundtrack album. On June 1, 2017, it was announced that Seyfried would return as Sophie. Later that month, Dominic Cooper confirmed that he would return for the sequel, along with Streep, Firth and Brosnan as Sky, Donna, Harry, and Sam, respectively. In July 2017, Baranski was also confirmed to return as Tanya. On July 12, 2017, Lily James was cast to play the role of young Donna. On August 3, 2017, Jeremy Irvine and Alexa Davies were also cast in the film, with Irvine playing Brosnan's character Sam in a past era, and Hugh Skinner to play Young Harry, Davies as a young Rosie, played by Julie Walters. On August 16, 2017, it was announced that Jessica Keenan Wynn had been cast as a young Tanya, who is played by Baranski. Julie Walters and Stellan Skarsgård also reprised their roles as Rosie and Bill, respectively. On October 16, 2017, it was announced that singer and actress Cher had joined the cast, in her first on-screen film role since 2010, and her first film with Streep since Silkwood. The part was written specifically for Cher, and she got to choose Andy García as her romantic partner. Principal photography on the film began on August 12, 2017 in Croatia, including the island of Vis. In October 2017, the cast gathered at Shepperton Studios in Surrey, England, to film song and dance numbers with Cher. Filming wrapped on December 2, 2017. Mamma Mia! Here We Go Again was released on July 20, 2018 by Universal Pictures, in the UK, US and other selected countries in both standard and IMAX formats. The film premiered on July 16, 2018 at the Hammersmith Apollo in London. The first trailer for the film was released on December 21, 2017, in front of Pitch Perfect 3, another Universal Pictures film. Cher performed "Fernando" at the Las Vegas CinemaCon on April 25, 2018, after footage of the film was shown. Universal sponsored YouTube stars the Merrell Twins to perform a cover version of the song "Mamma Mia" to promote the film. Mamma Mia! Here We Go Again was released via digital copy on October 9, 2018 and released on DVD, Blu-ray, and 4K UHD Combo Pack on October 23, 2018. The film debuted at the top of the NPD VideoScan First Alert chart for the week ending on October 27, 2018. It retained the top spot on the chart for the week ending on November 3, 2018. Mamma Mia! Here We Go Again grossed $120.6 million in the United States and Canada, and $274.1 million in other territories, for a total worldwide gross of $394.7 million, against a production budget of $75 million. In June 2018, three weeks prior to its release, official industry tracking had the film debuting to $27–33 million, which increased to as much as $36 million by the week of its release. It made $14.3 million on its first day, including $3.4 million from Thursday night previews. It went on to debut to $35 million, finishing second, behind fellow newcomer The Equalizer 2 ($36 million), and besting the opening of the first film ($27.8 million) by over 24%. It fell 57% to $15.1 million in its second weekend, finishing second behind newcomer Mission: Impossible – Fallout. In its third weekend the film grossed $9 million, dropping to fourth place, and $5.8 million in its fourth weekend, finishing seventh. In the United Kingdom, the film grossed $12.7 million in its opening weekend, topping the box office and achieving the fourth biggest opening for a film in 2018. In its second weekend of international release, the film made $26.6 million (for a running total of $98.6 million). Its largest new markets were France ($1.7 million), Poland ($1.3 million), Switzerland ($223,000) and Croatia ($151,000), while its best holdovers were Australia ($9.5 million), the UK ($8.6 million) and Germany ($8.2 million). In the United Kingdom, the film was the second highest grossing film of 2018, following Avengers: Infinity War, and is the fourteenth highest grossing film of all time. Lily James' performance as Young Donna was praised by critics as a "breakout" role. On review aggregation website Rotten Tomatoes, the film holds an approval rating of 81% based on 231 reviews, and a weighted average of 6.3/10. The website's critical consensus reads, "Mamma Mia! Here We Go Again doubles down on just about everything fans loved about the original—and my my, how can fans resist it?" On Metacritic the film has a weighted average score of 60 out of 100 based on 46 critics, indicating "mixed or average reviews". Audiences polled by CinemaScore gave the film an average grade of "A–" on an A+ to F scale, the same score as its predecessor, while PostTrak reported filmgoers gave it an 83% overall positive score. Peter Bradshaw of The Guardian termed the sequel as "weirdly irresistible" and gave it three out of five stars. He described his reaction to the first film as "a combination of hives and bubonic plague," but concedes that this time, the relentlessness and greater self-aware comedy made him smile. He concludes: "More enjoyable than I thought. But please. Enough now." Mark Kermode of The Observer gave the film five stars and commented, "This slick sequel delivers sharp one-liners, joyously contrived plot twists and an emotional punch that left our critic reeling." Peter Travers of Rolling Stone awarded the film two and a half stars out of five, noting the absence of Streep for the majority of the film hindered his enjoyment, and saying, "her absence is deeply felt since the three-time Oscar winner sang and danced her heart out as Donna Sheridan". Lindsay Bahr of Associated Press awarded the film three out of four stars, calling it "wholly ridiculous", but complimenting its self-awareness. She also praised James' performance and singing talent. Richard Roeper of the Chicago Sun-Times gave the sequel a mixed review, awarding it two stars out of four, criticizing the reprises of "Dancing Queen" and "Super Trouper" as uninspired, and feeling that some of the musical numbers dragged the pacing. He considered the younger counterparts to the main characters "energetic" and "likeable." Stephanie Zacharek of Time gave the film a mixed review, writing "Mamma Mia! Here We Go Again is atrocious. And wonderful. It's all the reasons you should never go to the movies. And all the reasons you should race to get a ticket." ^ a b Gleiberman, Owen (July 17, 2018). "Film Review: 'Mamma Mia! Here We Go Again'". Variety. Penske Business Media. Retrieved August 16, 2018. ^ "Mamma Mia! Here We Go Again". Legendary Entertainment. Retrieved August 19, 2018. ^ "Mamma Mia! Here We Go Again". AMC Theatres. Retrieved June 20, 2018. ^ a b c "Mamma Mia! Here We Go Again". Box Office Mojo. Retrieved January 23, 2019. ^ a b D'Alessandro, Anthony (July 26, 2018). "Imax Kicks Off Biggest Global Campaign Ever In 77 Countries: "Films To The Fullest"". Deadline Hollywood. Retrieved August 10, 2018. ^ Clopton, Ellis (July 17, 2018). "'Mamma Mia! Here We Go Again' Reviews: What the Critics Are Saying". Variety. Penske Business Media. Retrieved July 17, 2018. ^ Giles, Jeff (July 19, 2018). "Mamma Mia! Here We Go Again Is Certified Fresh". Rotten Tomatoes. Fandango Media. Retrieved July 25, 2018. ^ LATF Staff (July 13, 2018). "New Music Friday: Tinashe, DJ Snake, Mamma Mia Soundtrack..." LATF USA. Retrieved August 23, 2018. ^ "Mamma Mia! Here We Go Again Official Soundtrack Is Out Today". Umusic. July 13, 2018. Retrieved July 16, 2018. ^ Bamigboye, Baz (October 17, 2008). "Baz Bamigboye on a possible Mamma Mia sequel, Kate Winslet, Leonardo DiCaprio and much more". The Daily Mail. Associated Newspapers. Retrieved July 12, 2017. ^ Alexander, Bryan (May 19, 2017). "'Mamma Mia' sequel 'Here We Go Again' coming next summer". USA Today. Gannett Company. Retrieved July 12, 2017. ^ Busch, Anita (May 19, 2017). "'Mamma Mia: Here We Go Again!' On Universal Pictures' 2018 Schedule". Deadline Hollywood. Penske Business Media. Retrieved July 12, 2017. ^ Read-Dominguez, Jennifer (September 27, 2017). "Mamma Mia 2 Here We Go Again! songs officially revealed by Benny from ABBA". Digital Spy. Hearst Magazines UK. Retrieved December 4, 2017. ^ Fleming, Mike Jr. (June 1, 2017). "Amanda Seyfried Set For 'Mamma Mia!' Reprise". Deadline Hollywood. Penske Business Media. Retrieved July 12, 2017. ^ Seemayer, Zach (June 22, 2017). "EXCLUSIVE: Dominic Cooper Dishes on Returning for 'Mamma Mia 2': It's 'a Phone Call I've Been Waiting For'". Entertainment Tonight. CBS Studios. Retrieved July 12, 2017. ^ N'Duka, Amanda (July 12, 2017). "Christine Baranski Returning For Universal's 'Mamma Mia!' Sequel". Deadline Hollywood. Penske Business Media. Retrieved July 12, 2017. ^ Ford, Rebecca (July 12, 2017). "'Mamma Mia' Sequel Adds Lily James (Exclusive)". The Hollywood Reporter. Prometheus Global Media. Retrieved July 13, 2017. ^ Ramos, Dino-Ray; N'Duka, Amanda (August 3, 2017). "'Mamma Mia!' Sequel Adds Jeremy Irvine & 'Harlots' Actress Alexa Davies". Deadline Hollywood. Penske Business Media. Retrieved August 9, 2017. ^ McNary, Dave (August 16, 2017). "'Mamma Mia: Here We Go Again!' Casts Broadway Star Jessica Keenan Wynn". Variety. Penske Business Media. Retrieved August 22, 2017. ^ Perry, Spencer (August 22, 2017). "Here We Go Again: Mamma Mia! Sequel Begins Production". ComingSoon.net. Mandatory. Retrieved August 22, 2017. ^ a b Bamigboye, Baz (October 16, 2017). "Here she goes again: Cher prepares to return to the big screen with appearance in Mamma Mia 2". The Daily Mail. Associated Newspapers. Retrieved October 16, 2017. ^ McHenry, Jackson (July 18, 2018). "Why Mamma Mia! Here We Go Again Cast Cher As Meryl Streep's Mother". Vulture. New York Media. Retrieved August 14, 2018. ^ a b Demark, Nikolina (August 15, 2017). "Will the Filming of 'Mamma Mia' Affect the Island of Vis?". Total Croatia News. Retrieved August 16, 2017. ^ McCreesh, Louise (August 12, 2017). "Lily James shares snap of young Dynamos in Mamma Mia 2". Digital Spy. Hearst Magazines UK. Retrieved August 16, 2017. ^ Harrison, Ellie (August 14, 2017). "Lily James shares photo from the set of Mamma Mia! sequel". Radio Times. Immediate Media Company. Retrieved August 16, 2017. ^ Sommers, Kat (August 14, 2017). "First Look: The Dynamos Reunite as 'Mamma Mia 2' Starts Filming". BBC America. BBC. Retrieved August 16, 2017. ^ McCreesh, Louise (December 4, 2017). "Mamma Mia 2: Here We Go Again! has officially finished filming". Digital Spy. Hearst Magazines UK. Retrieved December 4, 2017. ^ Associated Press (May 19, 2017). "'Mamma Mia!' Film Sequel Gets July 2018 Release Date". U.S. News & World Report. Retrieved August 16, 2017. ^ Harding, Laura (July 16, 2018). "Meryl Streep and Cher to be dancing queens of Mamma Mia 2 premiere". Irish Independent. Independent News & Media. Retrieved July 16, 2018. ^ a b c D'Alessandro, Anthony (July 22, 2018). "Shocker: 'Mamma Mia 2' Meets B.O. Waterloo As 'Equalizer 2' Is The No. 1 Winner That Takes It All With $35M+". Deadline Hollywood. Penske Business Media. Retrieved July 22, 2018. ^ "October 23 Blu-ray, Digital and DVD Releases". Comingsoon.net. October 23, 2018. Retrieved October 24, 2018. ^ "'Mamma Mia! Here We Go Again' Sings to No. 1 on Disc Sales Charts". Mediaplaynews.com. November 1, 2018. Retrieved November 5, 2018. ^ "'Mamma Mia,' 'Ant-Man' Retain Top Spots on Disc Sales Charts". Mediaplaynews.com. November 15, 2018. Retrieved November 8, 2018. ^ McNary, Dave (June 28, 2018). "'Equalizer,' 'Mamma Mia' Sequels Head Toward $30 Million Domestic Openings". Variety. Penske Business Media. Retrieved June 30, 2018. ^ D'Alessandro, Anthony (July 18, 2018). "'Mamma Mia! Here We Go Again' To Hit The High Note At Weekend Box Office With $30M+". Deadline Hollywood. Penske Business Media. Retrieved July 18, 2018. ^ Associated Press (July 23, 2018). "Box Office Top 20: 'Equalizer 2' beats 'Mamma Mia' by a hair". The Washington Post. Retrieved July 23, 2018. ^ D'Alessandro, Anthony (July 29, 2018). "'Mission' Accomplished: 'Fallout' $61M+ Opening Reps Record For Tom Cruise Franchise – Sunday". Deadline Hollywood. Penske Business Media. Retrieved July 29, 2018. ^ "Box Office Top 20: New 'Mission: Impossible' hits No. 1". ABC News. Associated Press. July 30, 2018. Retrieved August 3, 2018. ^ D'Alessandro, Anthony (August 5, 2018). "'Mission' Notches Best 2nd Weekend For Franchise With $35M; 'Christopher Robin' No Eeyore With $25M – Sunday Box Office". Deadline Hollywood. Penske Business Media. Retrieved August 8, 2018. ^ Gant, Charles (July 24, 2018). "Mamma Mia! Here We Go Again stays on song as box office recovery continues". The Guardian. Guardian News and Media. Retrieved July 28, 2018. ^ Tartaglione, Nancy (July 29, 2018). "'Mission: Impossible – Fallout' Ignites Record $92M Overseas/$153.5M Global Bow – International Box Office". Deadline Hollywood. Penske Business Media. Retrieved July 30, 2018. ^ "2018 United Kingdom Yearly Box Office Results". Boxofficemojo. Retrieved February 4, 2019. ^ "Weekend box office figures". BFI. Retrieved February 4, 2019. ^ Erbland, Kate (July 17, 2018). "'Mamma Mia! Here We Go Again' Review: Lily James Is a Breakout, but This Energetic Sequel Misses Meryl Streep". IndieWire. Penske Business Media. Retrieved July 17, 2018. ^ "Mamma Mia! Here We Go Again (2018)". Rotten Tomatoes. Fandango Media. Retrieved December 3, 2018. ^ "Mamma Mia! Here We Go Again Reviews". Metacritic. CBS Interactive. Retrieved December 3, 2018. ^ Bradshaw, Peter (July 17, 2018). "Mamma Mia! Here We Go Again review – feta fever dream sequel is weirdly irresistible". The Guardian. Guardian News and Media. Retrieved July 21, 2018. ^ Kermode, Mark (July 22, 2018). "Mamma Mia! Here We Go Again review – full of hits and emotion". The Observer. Guardian News and Media. Retrieved July 22, 2018. ^ Travers, Peter (July 19, 2018). "'Mamma Mia! Here We Go Again' Review: ABBA-Fab Sequel Suffers From Streepless Throats". Rolling Stone. Retrieved July 23, 2018. ^ Bahr, Lindsay (July 17, 2018). "Review: Bask in the effervescent insanity of 'Mamma Mia 2'". Associated Press. Retrieved July 23, 2018. ^ Roeper, Richard (July 17, 2018). "'Mamma Mia! Here We Go Again' a campy sequel sure to please fans, my my". Chicago Sun-Times. Retrieved July 23, 2018. ^ Zacharek, Stephanie (July 30, 2018). "Mamma Mia: Here We Go Again Is Both Atrocious and Amazing". Time. Retrieved August 23, 2018. ^ USA TODAY Life staff (2018-09-24). "People's Choice Awards 2018: The nominees". USA Today. Retrieved 2018-09-25.